THE Court of Appeal has reversed a ruling by a Kumasi High Court, presided over by Justice Ansu Gyeabour, which granted an application of mandamus against the National House of Chiefs (NHC). The court, presided over by Justice R. K. Apaloo, noted that the name and particulars of Osagyefo Kwamina Enimil VI should remain on the NHC Register as the Omanhene of the Wassa Fiase Traditional Area. According to the court, the decision of the High Court was made in error, as it did not comply with the laws governing chieftaincy in the country. 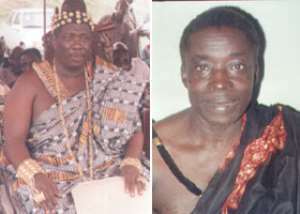 The High Court order, dated February 2008, was based on an application filed by Odeneho Akrofa Krukoko II, the deposed Paramount Chief of the Wassa Fiase Traditional Area, to compel the National House of Chiefs to delete from the National Register of Chiefs (NRC), the name and particulars of Osagyefo Kwamina Enimil VI as Omanhene of the Wassa Fiase Traditional Area, and rather reinstate his name and particulars as Omanhene of the area. The fact of the matter is that on the 6th of September 2004, the Kumasi High Court granted leave to Odeneho Akrofa Krukoko to file an application for the writ of mandamus, which was accordingly filed on the 9th of September 2004. When the writ of summons was served, both the National House of Chiefs (Appellant) and Osagyefo Kwamina Enimil (Interested party) raised preliminary objections on the grounds that the matter was a chieftaincy issue. The matter traveled to the Supreme Court, which eventually ordered that the record be transmitted to the High Court. On the 5th of November 2007, the Appellant filled a motion to dismiss or set aside the order granting leave to the Respondent, but the Kumasi High Court Judge dismissed the application as unmeritorious. The decision by the Kumasi High Court to dismiss the motion filled by the Appellant compelled the latter to file an appeal at the Court of Appeal. At the Appeal Court, Counsel for the Appellant, Sir Dennis Adjei, argued that the ruling of Ansu-Gyeabour was given contrary to judicial precedent. He further argued that the leave granted by Justice Ansu-Gyeabour was void, as it was granted contrary to law. Counsel Dennis Adjei was of the view that the High Court (Civil Procedure) rules 1954, (LN140A) under which this course of action accrued, set down a six month time limit, within which an application of mandamus could be brought, and where an application was out of time, provision was made for applicant (Odeneho Akrofa Krukoko) to apply for extension of time, and therefore that action was void. Counsel anchored his case on the Republic vs. National House of Chiefs Ex Parte; Fabil III and Others (1984-86) 2GLR731. To counsel, the ratio in the case cited above was binding on the Court of Appeal itself, as well as the Kumasi High Court, and therefore the latter could not depart from it. Counsel further argued that the refusal of Ansu-Gyeabour's Court to follow the Court of Appeal's decision in Ex Parte; Faibil, rendered the decision of the former void, and should therefore be set aside. In giving judgment, the Appeal Court, presided over by Justice R. K. Apaloo, ruled that it had delivered many decisions based on Order 59 R 3 of LN 14OA without any litigant or lawyer going to the Supreme Court to challenge the appropriateness of that particular order governing mandamus applications. LN 14OA the High Court Rules 1954 the Appeal Court Judges noted has been replaced by C147, and 'fortunately under Order 55 R 3 adequate provisions have been made for mandamus. “We do not feel inclined to depart from the principles enunciated in the Faibil case, and arising there from because judicial heresy in the sense of a departure from opinion or belief held within the legal system. “We accordingly state unequivocally that the trial High Court in Kumasi, presided over by Ansu-Gyeabour, was duty bound to follow the decision of the Court of Appeal in the case entitled Republic vs. National House of Chiefs and Annor; Ex Parte Faibil III (1984-86) 2GLR 731). “We are of the firm view that the decision and the view of the High Court Kumasi have been relegated to the background,” the Court of Appeal noted.